£54.94 on Amazon, £69.99 on toys'r'us website. 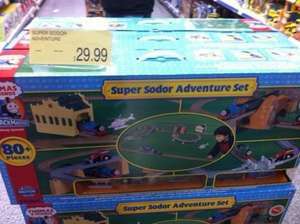 The Ultimate Thomas The Tank Engine Train Set - Super Sodor Adventure set. 80 pieces. It's a Tomy Trackmaster set so it is apparently compatible with other sets too. Approx. layout : 188 cm X 155cm. Battery-operated Thomas- takes 1 x 'AA' battery but not included. Battery-operated Percy- takes 1 x 'AA' battery but not included. Battery-operated Jack- takes 1 x 'AA' battery but not included. Paid £55 for one of these a few weeks ago for boy's xmas present. They are quite hard to find now but If I'd have known about this I'd have waited. They had these there this time last year, picked one up for my little boy, there great and well worth the money full price never mind for £29.99 if you can find one, buy one!! I've updated the original post with what's in the box. If anyone sees anything wrong or different, I'll fix it. Do Toys R Us take returns without a receipt? I just hope they have some left when I go back to buy it. They are even selling on ebay for more than this, so hopefully I'll get back before the traders get there. Great set, and price, my son would have loved this when he was younger, he was huge Thomas fan! Excellent price - no stores near me unfortunately (we are on the south coast) Would have xmas sorted!! I got mine too. Really pleased with it. Collected one from Musselburgh store, biggest set I've seen for half price - great deal.